The newly launched renewable energy certificate (REC) market has been witnessing a flurry of activity. Governments, regulators and project developers are upbeat, and the first trading day in March 2011 hit the ceiling price. Though the subsequent session was subdued, stakeholders are optimistic that the new market can quicken the harnessing of renewable energy potential of the country, which has been sluggish so far. But REC is not a magic wand to achieve clean energy goals and it could have problems. The scheme was launched by the Ministry of Power and the Ministry of New and Renewable Energy to give impetus to the tardy pace of renewable energy development in many states. Through the Electricity Act of 2003, the concept of renewable energy purchase obligation (RPO) was introduced to encourage non-conventional energy sources. Some states did have non-conventional energy targets before, but RPO implied they had to commit purchasing a quota of energy from non-conventional sources like wind, biomass and small hydro plants by 2010. By 2006, many states announced their RPOs and the governments strengthened the premium prices for purchase of renewable power, called “feed-in tariffs”. The governments hoped the market players will pick up the bait and states would move rapidly towards meeting the RPOs. Only a handful of states showed any progress. In 2008, regulators had to remodel the renewable energy policy, largely because prices of conventional energy sources like coal and gas were rising and there were international demands on India to step up its low carbon efforts. So the National Action Plan for Climate Change stipulated a renewable energy target of five per cent of total power generated in 2010, going up by one per cent a year to reach 15 per cent by 2020. The targets were ambitious and they made regulators launch a fancy sounding scheme borrowed directly from the US and European markets: the REC market. Under the scheme, each electricity distribution company, or discom, not meeting its RPO target would have to purchase an amount equivalent to the shortfall of quota in the form of REC credits. Each REC credit is equivalent to one mega-Watt-hour (MWh) fed to the grid and regulators fixed the price band for non-solar renewable energy projects between Rs 1.5/kWh and Rs 3.9/kWh. This REC price is over and above the average pooled electricity price, hovering around Rs 2.2/kWh, that is obtained by discoms from conventional sources like coal and large hydro plants. The Central Electricity Regulatory Commission (CERC) spelt out clearly that the monetary value of REC thus equals to the “environmental attribute” of renewable energy fed to the grid—a concept they did not elaborate. They also stipulated each REC has to be retired within a year of issuance. A renewable energy project developer has the option to either go for the vanilla feed-in-tariff incentive scheme or opt for an average pooled price that can be topped by selling RECs. The first trading session—where the exchange happened at the ceiling price of Rs 3.9/kWh—sent out a clear message that should alarm policy designers. REC market could become a self-fulfilling scheme for electricity regulators that could set the discoms, end-users and state governments on the path of fiscal ruin. Given that project developers have a choice between feed-in-tariffs and a scheme with a cumulative floor price just shy of the feed-in-tariffs, a large share of new renewable energy project developers could opt for the REC market. And when the market moves closer to the ceiling price most often the developers can expect a windfall. Who could be the loser then? The discom and the home state where the REC project is located. If the project opts for REC, it can sell the “environmental attribute” of its clean energy to any discom in the country. The home state thus cannot necessarily include the project for its in-house RPO compliance. So if the REC market flourishes unabatedly, states will not be able to meet their incremental RPO targets and will have to push their discoms to buy the expensive REC credits, creating further market demand and making high REC prices inevitable. The increasing price of coal-based power generation could also shift the scale towards REC. States will have no option but to raise feed-in-tariffs to meet the RPO quota. They may also have to announce additional sops to attract in-house projects. The REC scheme could thus end up with returns higher than the 15-20 per cent range the electricity regulators envisage for a project. If every future project developer opts for REC, imagine the financial upheaval it can create, and the resulting uncertainty. The big question is: have the policy designers thought of such a worst-case scenario? It may also lead to states discouraging new projects under REC. The second contention is: do REC projects also qualify for global carbon market trading regimes under the Kyoto Protocol and voluntary carbon markets? Can the same “environmental attribute” be sold twice, nationally and then globally? The voluntary carbon standard has clearly laid out disqualification guidelines but the UN’s Clean Development Mechanism (CDM) has not spelt out any criterion yet. A biomass project in Chhattisgarh, which is registered under both CDM and REC, is expecting a windfall from this policy loophole. Indian electricity regulators and climate negotiators have so far turned away from confronting this difficult question. In fact, if REC projects continue to qualify for CDM, there is more incentive for project developers to shift to REC than opt for feed-in-tariff route. This will only aggravate problems for discoms as discussed earlier. Lastly, the major buyers of RECs will be discoms who do not have any say in ensuring a state’s RPO targets are met in the required timeframe. That is the responsibility of the state, which has to announce promotional schemes to attract project developers and streamline the process for setting up projects. Only a handful of states have done that so far. So in case a state is tardy to meet its new RPO, discoms will have to bear the financial brunt of purchasing RECs. This can lead to two possible outcomes—one, discom passes on the cost of RECs to its end-users like households, shops and industries. Second, the state bails out the discom, inviting taxpayers’ fury. Most discoms being state-owned and already reeling under operational losses, further financial bail-outs by state governments would not be taken lightly by citizens. The Maharashtra State Electricity Distribution Company Ltd, a discom, has already voiced concerns of the state electricity regulator’s new RPO targets as “impractical”. could become unaffordable for some poorer discoms. To counter such circumstances, framers of REC regulations have inserted a “carry forward” clause where the shortfall can be stretched till the RPO of 2020. In case state electricity regulators apply this lifeline, there could be a domino effect, reducing the demand for RECs and thereby causing market uncertainty. Of course, the additional funds required by discoms could be financed from the National Clean Energy Fund launched in the 2009-10 Union budget. But the source of this fund is actually by a levy on coal, the same fuel which largely determines the average pooled cost of power. Any increase in coal levy would shift the balance towards the REC. Another source of finance could be post-2012 international carbon funds. But then care needs to be taken on the double counting of “environmental attributes”. Even if it is resolved, can India show the REC projects under its autonomous climate mitigation action? There needs to be a comprehensive analysis of the renewable energy trading mechanism to ensure fair and even distribution of fiscal returns for unlimited projects rather than windfalls for smaller number of projects. The question of who is ultimately liable financially for purchasing RECs also needs answers. Another point about RECs is the uncertainty to the developer regarding the cash flows, which can impact the debt service capability of the developer and banks may find it difficult to even provide debt to such projects. Also the regulatory compliance by obligated entities is yet to seen as till now very few discoms have been successfull in meeting their RPO targets and till now even SERCs have been reluctant towards levying any penalty on discoms. further, the REC projects are profitable in only those states which have higher average pooled prices. If a generator is suffering losses under REC regime, then it will not be able to switch to preferential tariff. 1. Trade results of RECs for April month should have also been taken into account which reflected the 'other side of the story'. First trade saw very high prices. But, the reasons were different. Second trade touched floor price!! 2. 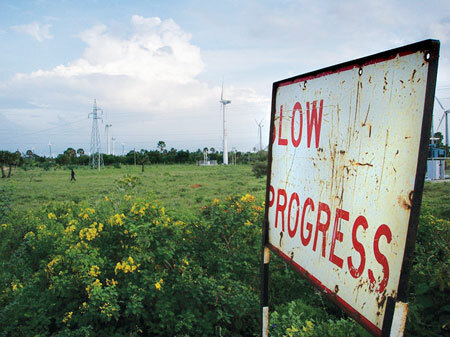 DISCOMs have very strong say in fixing up RPO. Further, many SERCs have come up with compliance guidelines which would guide state DISCOMs to comply with it accordingly. 3. CDM Vs. REC: Except the definition of environmental attributes, there is no direct relation between CDM and REC. However, REC has a reverse integration with CDM in which the 'additionality' of the project under CDM could get challanged. Hence, this reverse integration of REC into CDM mechanism would automatically take care of 'double counting' of environmental attributes. However, I agree that clear demarcation of environmental attributes is required to avoid confusion. 4. Possibility of all new projects participating into REC: I would say, this is a very very extreme imagination of the situation. Not many projects can make 'money' into REC mechanism as APPCC / market price of electricity + REC may realise revenue less than FIT that a project could avail (e.g Biomass Projects, few wind projects in Maharashtra etc.). Futher, there is a larrge risk looming on the projects that are participating into REC. If the RPOs are not enforced strictly, the market may 'fail' in first year itself and disappoint all the investors who are bullish about REC mechanism!! I would like to add another problem that could jeopardize the REC plan, Financing. Atleast, as far as solar projects are concerned (i cannot comment on other RE projects since i do not know much about them), banks and other financial institutes are not willing to provide the much needed debt-funding for such a project. The funding has been rejected on the basis that funding for RECs are analogous to funding for shares, and banks do not fund for investing in tradable-paper commodities. Infact, project developers with firm PPAs (FITs of Rs 15.3/ unit) are finding it difficult to raise debt funding despite showing feasibility of the project, but banks are willing to fund only against collaterals. I know a few people who are willing to invest in these REC projects for solar, but are finding it difficult to raise the required debt funding. One last issue i see with Solar Projects in general, in the light of the new land-controversies (in various states) is acquiring the massive land required for such projects. Political parties will take mileage out of these acquisitions of land, and farmers even in the most draught areas of the country will not be willing to let of of their land easily. In the event that they do, once the projects are under construction, they may make the most of opportunity and come back to claim a higher compensation. There are many such concerns, which are not just applicable to REC markets, but to the Solar Industry as a whole. 3)CDM and/or REC - needs clear guidelines as you mentioned. CDM however has loopholes currently. 4)Again it's just a hypothesis. No confidence in REC doesn't serve the mechanism itself. Good article. Few points 1. 1. There needs to be effort towards ensuring true price discovery, as has been shown by the first two trading sessions. Without it, there are bound to be significant variations in the financial returns to project developers from REC mechanism. 2. One area needs to be thought through clearly - if the REC market flourishes (deprieving states of their in-house PPAs that meet the RPO), there will also be significant number of RECs available for trading. I do not see why all the RECs in the market should be expensive in that case. The in-house PPA vs REC would behave as same commodity as far as RPO is concerned. 3. CDM and REC - The clarity on environmental attribute definition is important, but the CDM/REC are different monetization patterns and values. Something like 60 paisa vs 1.5-3.9 rs/unit. And from a RE market development point of view, super-normal profits should exist in the initial phase to drive investments and sector growth. The current design of REC scheme has shortcomings and leave a lot of room for improvement. I have pointed these out to CERC in two of its public hearings as well. But little has changed (except an amendment that was brought to address an issues that was highlighted). Those interested may look at a comprehensive analysis of REC scheme in the recent India Infrastructure Report (IIR) 2011 at the following link http://www.idfc.com/pdf/report/Chapter-3.pdf (an earlier paper (2009) on RECs in RSER journal can be accessed from sciencedirect. RECs for India were originally proposed in a 2006 conference paper). An interesting finding is that the cost of embedded carbon due to high floor and forbearance price of the Indian REC scheme is much higher (Euro 25-64 per tco2 for non-solar and nearly Euro 200 for solar) than the value of the same in the European carbon markets (Euro 10-15 per tco2). See the paper for details. Apart from this, there are other issues like market participation, liquidity and alternatives to the floor and forbearance price. The paper also suggests a common REC market using a multiplier scheme. This shows that market instruments itself are not a panacea. Design of the scheme and the institutional response holds the key to deriving economic benefits from such schemes. The CERC has eventually blinked on REC scheme http://www.cercind.gov.in/regulation/Order_142_2011.html last week and plans to reduce floor and forbearance price but for only one year (2012-13). Another typical ad-hoc measure by government agencies and regulators (such as CERC) which do not make good analysis and take a long term view for the policy stability. This will severely affect market confidence on REC scheme as mentioned in the article. The CERC draft order to reduce floor and forbearance price if for the next 'control period' - April 2012 to March 2015. The draft order specifies so. Thanks, stands corrected - the next 'control period' is for three years. Nonetheless, we need to appreciate that this is too short a duration for robust determination of returns on RE projects. as gone through your articel it is very nice but i have some query for this mechanisum as stated below? 1 when you apply for REC then you can also apply for CDM ? any one can give me the regulation terms on REC in india? Very good article and equally good follow up to ... as you have mentioned (in one of your responses to comments, it may not be favourable from a project developer perpespective). So sir, don't you think until and unless a favourable environment is provided to a project developer (especially for solar), it would be difficult to meet the various optimistic mission goals of our government. Though, with loop holes, CDM was a very important means of finance considering the capital cost involved. Future of CDM is also not very clear and with REC also not favouring project developers, wouldn't the supply and demand gap increase further.